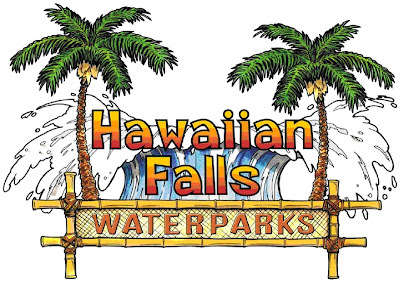 For my birthday this year, Michael got me and the boys season passes to the waterpark, Hawaiian Falls. We went ALL.THE.TIME...probably 2 times a week most weeks since it opened. Well, this week was the last week that it would be open for the weekdays, so we went to the park for (probably) the last time this season. It was PACKED! We got there a little earlier than usual and had to wait in a long line. The boys hung around...literally. Like I said...they were literally hanging around while waiting for the gates to open. My little kindergarten-er. (I know...probably not a word, but who cares) I still can't believe my baby is going to be going to school in a few short days. This is the sign for the area the boys most like at this waterpark. Splashwater Harbor is a pool area. Their favorite area is just a regular pool..with no waves or slides...sigh. They most like the pool area because they can go underwater and do "tricks" and things. They usually take turns and you usually just hear things like "Watch this..." and "I can do that too!" I don't remember what was going on here...but it looks like a collision of showing tricks. Sometimes they would get sick of watching each other and would go at the same time.